I have been meaning to share a wonderful shop that I am now a part of called Envi! My wonderful friend Cindy Perry was for a long time telling me of this wonderful little shop. It is located in Colorado Springs (Old Colorado City) and she drives by it as she goes to her little cabin in Manitou Springs. So one weekend early in June she took me to check it out! It is truly a fun, funky little shop. After browsing around for awhile and getting enough courage to talk to the shop owner, I asked if I could show him some of the goodies that I make. He readily agreed, so I ran to get the box of items that I had brought along! He took a peek at all of the goodies and was very excited with what I had brought, so he called his wife (she does all of the buying for the store) to come down and have a look as well. When she got there she liked the goodies to! I was expecting to have them just consign some of my items, but instead they just bought many items at my wholesale prices. I am so glad that they are going to do wholesale orders, that way I won't have to worry about tracking the inventory each month. They even placed an order that very day for more goodies. 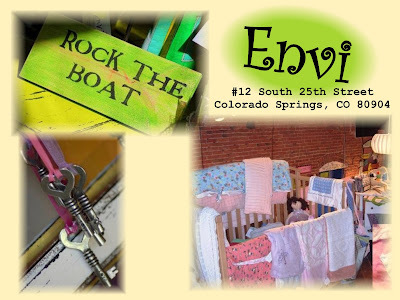 I am so excited to be a part of this shop...so if you are ever in Colorado Springs please stop in to Envi and have a peek. Congratulations for being part of this adorable store. Ohhh we were *just* there! I wish I'd have known to check out this store. Congrats! How exciting. It looks like a great shop!